Continuing 20 years of building and maintaining the Global Positioning System, the workhorse Delta 2 rocket this morning successfully launched another satellite for the navigation network known the world over. The 12-story booster rumbled out of Cape Canaveral's pad 17A at 4:34 a.m. EDT, shaking the sleeping Space Coast and dashing into the predawn skies. Burning and separating its nine strap-on solid motors as designed, the kerosene-powered first stage pushed the rocket 60 miles up. The hypergolic second stage then assumed control, igniting its engine and jettisoning the nose cone shrouding the GPS 2R-20 satellite payload. The rocket eased into an initial orbit over the central Atlantic Ocean and began a peaceful coast through space to reach the skies over the western Pacific. In view of the tracking station on Guam, the second stage fired briefly to raise the orbit and then released the solid-fuel third stage to propel the new GPS satellite into its prescribed orbit. Launch managers back at the Cape anxiously waited for the rocket to complete its programmed sequence, finally receiving the news of a successful deployment of the GPS 2R-20 spacecraft about 68 minutes after liftoff. "Congratulations to the entire team for their hard work and dedication to the mission," said Brig. Gen. Edward L. Bolton Jr., 45th Space Wing commander at the Cape. "The launch of another GPS satellite provides our warfighters a system on which they can depend to complete their missions successfully." "It's great to see months of hard work by the team pay off in the form of a successful launch," added 1st Lt. Jonathan McGuire, the Delta 2 booster operations controller. "It's been a long wait, but knowing that this satellite will be directly supporting the war on terrorism was a reward worth waiting for." The GPS 2R-20 spacecraft will rejuvenate one of the navigation constellation's positions, while also conducting critical tests of a new signal to be fielded by follow-on satellites. The craft will replace the aging GPS 2A-27 satellite launched in September 1996. Now well past its design life, ground controllers plan to move the old satellite into a backup role. The new GPS 2R-20 spacecraft will take over the Plane B, Slot 2 location of the navigation network, considered one of the primary positions in the constellation that is divided into six orbital groupings with multiple satellites flying in each. "GPS contributes vital capabilities to our nation's military operations, global information infrastructure, emergency response, transportation and telecommunication industries, the international economy and everyday life. Our commitment is to ensure this emerging capability continues to deliver precise positioning, navigation and timing service to users around the globe," said Mike Dunn, technical director of the Space and Missile Systems Center's Global Positioning Systems Wing. The satellite is the seventh in a series of eight equipped with modernized features. The upgraded satellites transmit additional signals and offer improvements aimed at greater accuracy, tougher resistance to interference and enhanced performance for users around the world. "Every year we have made the GPS signal better, every year the accuracy of the system has improved," said Gen. Robert Kehler, commander of Air Force Space Command. "And that is what is going to continue to happen." The satellite is the 20th built by Lockheed Martin, but the two-ton craft is unique because it carries a special demonstration package to test a new civil signal, called L5, planned for the aviation community. "This is a demonstration of that signal," said Tom Nagle, program manager of civil applications at the Transportation Department. "It is a key part of all aviation planning for the next generation aviation systems." Taking advantage of the satellite's auxiliary payload accommodations and modifying available parts in inventory, Lockheed Martin was able to add the new L5 signal in a straight-forward fashion. Two boxes were put on the spacecraft, increasing its weight by about 40 pounds. "Just using the capabilities of the vehicle, some of the spare parts that we had on the modernization program, we were able to modify them to add the demonstration," said Dave Podlesney, a GPS executive at Lockheed Martin. The Air Force needs the satellite in orbit and the new frequency demonstrated before an International Telecommunications Union deadline in late August. The in-space testing of the L5 system on this satellite will verify the new frequency doesn't impact the other signals being broadcast. "So that's an important way to the pave the path for future use," Dunn said. The next generation GPS 2F satellites, being built by Boeing, will transmit the new L5 signal when they begin launching over the next few years. "The signal has higher power than the other signals that we have, which allows more protection from interference sources. Also, the signal is in a band that is protected by the aviation community," Nagle said. Delays in the GPS 2F program prompted the Air Force to have Lockheed Martin add the demonstration to this satellite to ensure the U.S. government could secure the rights to the frequency. Flying much the same mission as its inaugural flight two decades ago that deployed a GPS satellite, today's Delta 2 launch occurred just a month after the rocket celebrated its 20th anniversary. This latest success is the 47th GPS spacecraft put into orbit by the venerable rocket. 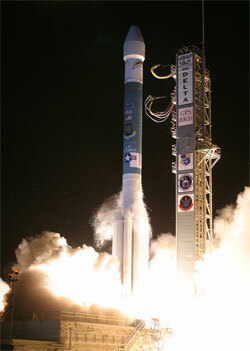 "One third of the 140 successful Delta 2 launches have been dedicated to GPS satellites. The ULA Delta team is extremely proud of the role we've played in launching this incredible satellite constellation," said Jim Sponnick, United Launch Alliance's vice president of the Delta Product Line. "During the past two decades, GPS has changed how people navigate around their neighborhoods and around the globe. GPS has also greatly improved military operations as well as numerous maritime, aircraft and business operations worldwide." Born in the late 1980s during an overhaul of U.S. space policy following the Challenger accident, the Delta 2 was conceived as part of the nation's desire to shift its dependence away from the space shuttle. New expendable boosters were ordered to launch satellites, and the Air Force's Global Positioning System would become the anchor customer for the Delta 2. "The Delta 2 program was started back in 1987. It was one of the programs that the Air Force started after the Challenger accident, and then the first launch was in 1989. So this launch vehicle has had a long history of successful launches and service to the country, both military and civil users," said John Wagner, technical director of the Launch and Range Systems Wing at the Space and Missile Systems Center. "There's a lot of us, including myself, that were part of the original Delta 2 program. I had the honor being part of it back in 1989 when I was assigned at the Pentagon, and worked it when I was assigned at Vandenberg. There is a lot of pride that this program has been a huge success for the Air Force. It's done everything that we've asked it to do, plus more, and it's helped carry us into the 21st century." The Air Force has just one more Delta 2 rocket left to fly. Its stages sit in hangars at Cape Canaveral awaiting on-pad assembly to begin May 27, said Lt. Col. Erik Bowman, commander of the 1st Space Launch Squadron. Liftoff is planned for August 21 to loft the final Block 2R satellite in the GPS replenishment program. It's also the final scheduled use of pad 17A. The GPS 2R-21 satellite was delivered to the launch site in January 2008. The craft will be brought out of storage and begin its pre-flight processing campaign in June, said Lt. Col. John Wagner, commander of the 45th Launch Support Squadron at the Cape. Although the Delta 2 proved to be highly reliable for medium-size satellites, the Air Force is transitioning to newer rockets -- the larger Atlas 5 and Delta 4 vehicles -- that are meant to be versatile in launching a range of different payloads. "While we'll be sorry to see it go, obviously, it's been a bridge toward Delta 4," Wagner said. A Delta 4 rocket, for instance, is slated to launch first GPS 2F satellite at the end of 2009. United Launch Alliance has eight other Delta 2 launches for NASA and commercial customers planned through 2011. The company also has five rockets available to sell.